It’s that time of year again, Black Widow season! We tend to find that around early fall, late August to September, is the time of year when spiders of all species are more prevalent and more often spotted by home owners; the Black Widow is no exception to this. As the temperatures start dropping, Black Widows look for a location with more warmth and sunlight. Because of this, you will often spot this particular arachnid in your window wells, next to your porch steps (often in corners), and unfortunately, making their way into your homes where there is plenty of warmth (generally around or by windows). 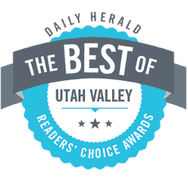 Black Widows are of particular concern because they are the most prevalent poisonous spider species here in Utah. If this spider gets into your home it can bite you, your children, or your pets; causing extreme pain, discomfort, and often times, hospitalization. 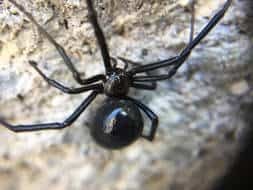 Black Widows are generally easy to spot because of the roundness of bellies, extremely shinny “skin”, pitch black coloring, and a red hourglass shape on their inner belly. Some Black Widows; although, it is rare, will have no red spot on their abdomen, often making people unaware that it is in fact a Black Widow they are dealing with. Some adult Black Widows will have no red hourglass on their abdomens and instead will have a pair of red spots, or often times, no red on them at all. These, red-less, Black Widows are the same as any Black Widow though; poisonous and dangerous. It is incredibly important that you get your home treated during the height of Black Widow season to keep your family and pets safe. We recommend treatment Spring, Summer, and Fall to make sure your home is always safe from this dangerous pest. It is important that you get your home treated before it gets to cold outside to prevent insects of all kinds, but especially the Black Widow, from entering into your home and making it their own over the cold winter.